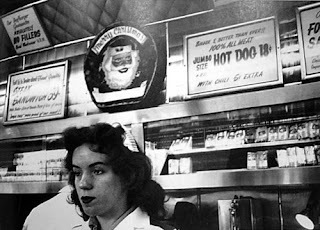 Robert Frank per Jack Kerouac: "sucked a sad poem"
After looking at the photographs to be published in The Americans, Jack Kerouac said of Robert Frank that he had "sucked a sad poem right out of America onto film." At right is one of the 83 photographs published in the book. Kerouac wrote the preface.